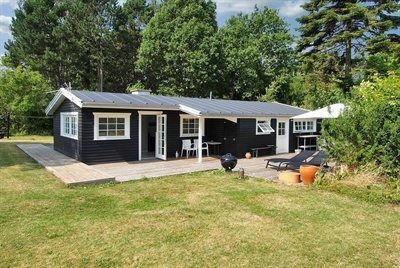 A really wonderful, light, and well-furnished 112 m2 summer cottage from 1963 (partly renovated in 2013) on a 1518 m2 plot lying not far from Nykoebing Sjaelland and just 625 metres from some of Denmark’s best and most child-friendly beaches. There is a 100 m2 open and a 4 m2 roofed terrace with garden furniture. It is possible to see 23 TV-channels (incl. 4 German). Please note that the doublebed is placed in the house’s annex. No pets allowed. Holiday home suitable for 6 persons . The holiday home is 112 m² and is build in 1963. In 2013 the holiday home was partial renovated. No pets allowed.The holiday home is equipped with 1 energy-saving heat pump. The holiday home has washing machine. Freezer with a capacity of 45 litres. Further more there is 1 wood-burning stove. For the youngest ones there is 1 high chair. The holiday home is situated on a 1518 m² garden site. Situated 625 m from the sea. Nearest shop is 1200 m away. You will find a golf course in a distance of 5800 m. A 100 m² terrace belong to the holiday home. Furthermore the house has a 4 m² covered terrace. Swing. Parking place by the holiday home.